Happy New Year! It’s 2018 and that means it’s time to put your New Year’s resolutions into action. There are always the popular resolutions: vowing to eat less, exercise more or finally organize the paperwork that’s piled up in your home office. Here at Royal Home Improvement, we have another resolution worth adding to the list: remodel your home! You know it’s something you’ve wanted to do for years, so let’s make 2018 the year to do it! But how do you even get started? 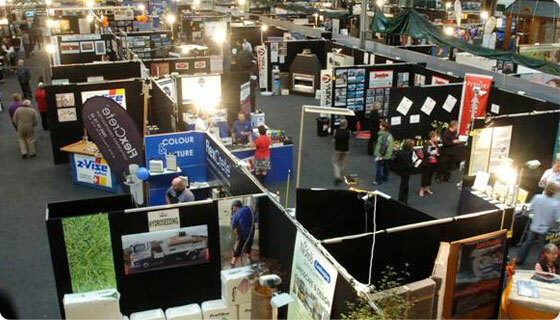 Have you ever attended a home show? They are the perfect place to find inspiration for your next home or remodel. Or, maybe you have lots of ideas in your head and need help thinking through your ideas and how to make those ideas come to life. No matter which end of the spectrum you’re at, a home show might be the answer. Our Royal Home Improvement team attends a number of home shows per year that are definitely worth checking out. Here are a few reasons why we think attending a home show is a good idea for you. Home shows can give you inspiration. You know that project of yours that you’ve wanted to do something about for years? Home shows are the perfect place to get ideas about how to design your current home project. They’re usually a one-stop shop to find the products you need to complete what you have in mind. You might even find an idea for a room that you hadn’t thought about before! Home shows can create opportunities to meet contractors. Not sure who you should ask to come repair your windows to make it them energy-efficient? (Spoiler: It’s us!) Go to a home show! Not only will the products you need be available, you can possibly meet the people who would actually be completing your project in your home. This will give you a chance to see who you are most comfortable with inviting into your home. You can see products in action. Not sure what a metal roof might look like in person? Our Royal Home Improvement booths usually feature displays of our metal roofs, gutters or siding, as well as other popular products. Most vendors will have live demonstrations of their products they are featuring. Expert speakers can give you advice on your project. A lot of home shows feature expert speakers who can give you ideas for your home or advice on your project. More often than not, these speakers can give you examples of projects they’ve tried that were a huge success and those that were complete failures. Real-life examples can give you a little perspective on how big your project is or how long it might take to become a reality. We like home shows because they give us a chance to meet with you – our future Royal Home Improvement customers. Stop by and visit with us, we won’t pressure you to buy something from us. This is just a great first step into a project for your house to make your home as comfortable as possible. Be sure to stop by our booth and say hello. If you can’t wait until the home shows to create the home of your dreams (and we can’t blame you), give us a call at (877)-85 ROYAL.